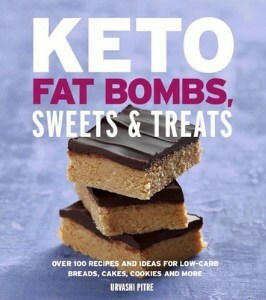 Looking for a fun Keto Patriotic Dessert? 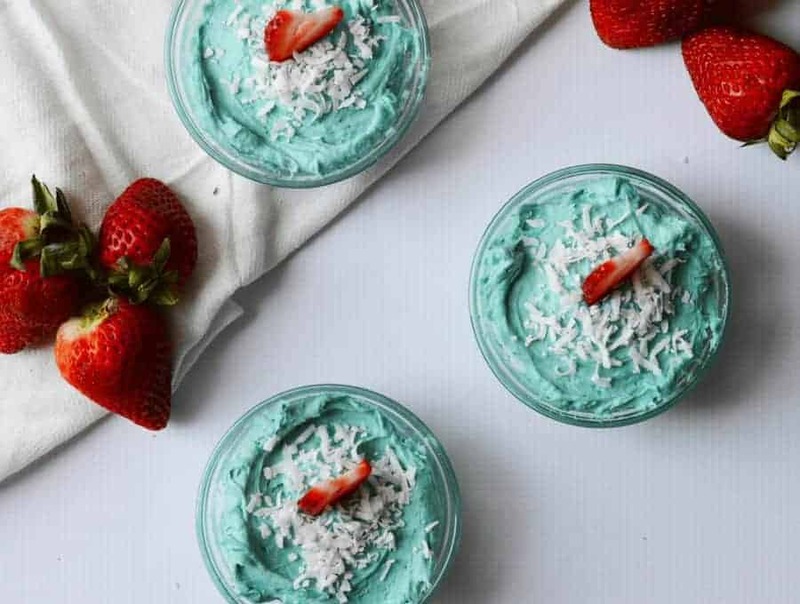 This two-ingredient cheesecake mousse takes no time to make, and is perfect for any red, white and blue function you may be hosting or attending! Holidays are an easy way to get off-track with your diet plan. Even if you’ve made a lifestyle change, it can be easy to slip back into old habits during the holiday season. By preparing diet-friendly foods and desserts to make or to bring with you, you give yourself options to stay on track. 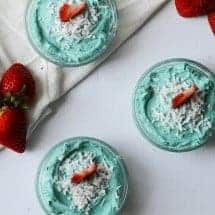 This Keto Patriotic Dessert is not only delicious, it’s super simple! It takes about 5 minutes to put together and turns out super cute too! 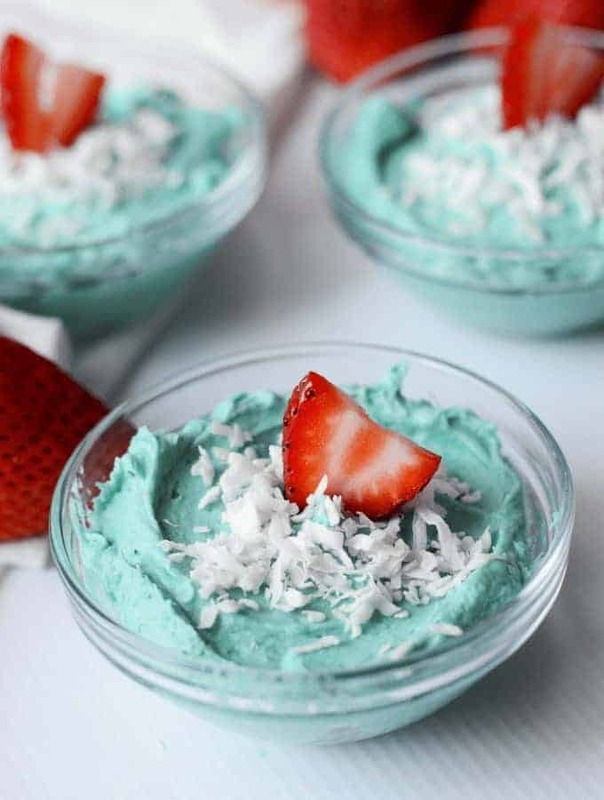 The cheesecake mousse is made blue by adding gel food coloring, but if you want to eliminate food dyes, you can leave it out. And, speaking of substitutions, you could always switch out the slice of strawberry for a raspberry as well. Raspberries are lower in carbs than strawberries, but with just a single slice of strawberry it’s totally safe for Keto. IF YOU LOVE CHEESECAKE, YOU NEED TO MAKE MY KETO LEMON RICOTTA CHEESECAKE! This Keto Patriotic Dessert also makes 4 servings, so you’ll have plenty to serve more than one person, or have extra servings for yourself on different days! Either way, it’s a win win! Put the pudding and the heavy whipping cream in a large bowl. Whisk the ingredients together until they form thick peaks. Fold in the blue food coloring until there are no longer any streaks. Add a teaspoon of coconut and a strawberry slice to each bowl for garnishing. Serve chilled. Macros don't include the optional coconut. Can this recipe be used with other sugar free instant pudding mix? Would chocolate pudding work?